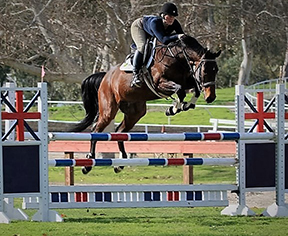 Kiersti Wylie is an “A” member of Sandia Creek Ranch Pony Club Riding Center, in the Southern California Region. She began riding before she could walk and started eventing at 5 years old on her pony, Here Comes Trouble. She lives, works, and trains on her family’s ranch where they breed, raise, and train Welsh X ponies and develop sport horses. The ranch is home to the USPC riding center, and an equine rescue, where Kiersti is a key part in restarting the horses and bringing them along. Kiersti Loves to find what each horse does best and then helps them excel at it. She has evented up to Intermediate level, shown Level 5 show jumping, and 2nd level dressage. You almost always find her at the barn, she loves helping the younger Pony Club members, playing with the foals, or riding bridleless. On the rare occasion she’s not at the barn she is usually off hiking or Line dancing. Kiersti is thrilled to be part of this amazing exchange, meet new friends, and represent the USA and USPC.